One of the best things about summer is the fresh fruit available, more importantly the Fresh Berries available. My favorite place to go is the local Farmer’s Market. I love browsing all the colorful displays of fruit and vegetables, but you just cannot beat those gorgeous summer berries. This year our home garden has expanded to include about 10 strawberry plants, 3 blueberry bushes and my brand new baby, a Goji Berry bush. I cannot WAIT to use up the berries and EVEN the antioxidant-rich leaves as a savory addition to my stir fries and salads. Oh yeah. This week’s #SundaySupper theme is Summer Berries and I am honored to be hosting this grand event. The recipe line up coming this Sunday is absolutely amazing, and after they all go live, I will be updating this post with direct links to all of these wonderful, delicious, mouth-watering recipes! In the meantime, I’d like to give you a little sneak peek, so you can get ready to visit these great recipe on Sunday! 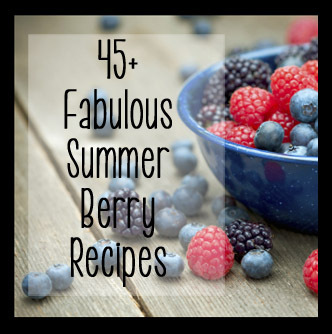 Here is a list of all of the recipes provided in our Summer Berries #SundaySupper. I’m sure you’ll find a bunch you’d like to make in your own kitchen. Look what we’re sponsoring! Come join us in sunny Orlando, this July! Awesome line-up and I can’t wait to see the recipes! Thanks so much for hosting Nicole! Beautiful post and pictures. I love berries…It all looks fantastic, Nicole. Thank you so much for hosting! Thanks for hosting this Nicole! What a beautiful line up of recipes! I adore berries–stumbled the page. Thank you Nicole!!! I am so excited you are hosting this week’s #SundaySupper… love berries. Thanks Nicole! What a great lineup of recipes.